Got the soul for getting down? Ready to put some stank on it? Then step back in time this Halloween as the oracles of 70’s soul Chunk o’ Funk defibrillate a cold, funk-less world with the most righteous Halloween party ever! The legendary 14-piece funk masters will tear the roof off the Danforth Music Hall on October 28, 2017 – and everyone’s invited. 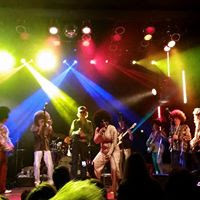 Chunk o’ Funk’s mega-funk explosion promises anyone with a nostalgia for pure funk complete with hi-hats, wah -wah pedals, righteous clothes and gravity-defying hair, a chance to rekindle that flame and celebrate a definitive part of Toronto’s live music legacy. good vibes” –regularly packed infamous live music hotspots such as the BamBoo and Copa. People drawn to the funk would soon discover the (literally) unbelievable mythology of the band that had themselves frozen in cryogenic suspension and “unthawed” to bring the funk to a soulless future. Modeled after bands like The Commodoresand The Ohio Players, Chunk o’ Funk won legions of fans for their commitment to the gritty honesty of classic funk and had a lot of fun in the process. The 14-member outfit all perform under highly theatrical, wildly costumed personas who exemplify the style, attitude, fashion and even the language that peaked in the 1970s. Accomplished musicians who took the music – if not themselves – seriously, Chunk o’ Funk even penned a number of tracks written in the same 70’s classic cement-heavy funk beats including this original single If Spock Loved a Woman. Chunk o’ Funk once ruled the soul, dance and R&B airwaves in the 70’s. However, as the 80’s arrived, Chunk o’ Funk saw ‘real’ music with authentic horn sections and rump busting beats being replaced by effete, pasty-faced keyboardists in ill-fitting jackets and skinny ties playing music stiffer than Lee Majors. They despaired as the natural afros intended by the Lord were replaced by hair-sprayed, scarf-wearing, pouting metal-bands. Dance music itself became mocked. Music had lost its way. Professor Limited, PhD in Funk and the only COF member with an education, suggested the band freeze itself, preserving the spirit of Funk for a later generation who might appreciate their brand of uninhibited soul. The Professor devised ‘cryogenic sleeping chambers’ – which consisted mostly of water beds and milk jugs filled with ice – in which the band reposed to hibernate away until the 21st century. Eventually, Chunk o’ Funk were bludgeoned awake in 1987 by the sounds of grunge music being played on the other side of their thin, tenement apartment wall. What was this new horror? Unable to get back to sleep, over a breakfast of Kraft dinner and hot dogs, they agreed this was clearly a sign the world needed to get back it’s groove. Grabbing their instruments they hit the road again, touring the country, opening eyes and hearts to the sounds of the ’70s, continuing to break attendance and booze-sale records everywhere they played. But growing tired of excesses and successes, they once again returned to the pods to sleep away a mighty hang over and reappear in the distant future. But something went HORRIBLE WRONG! Mysteriously, the band disappeared from their cryolab and were no where to be found. 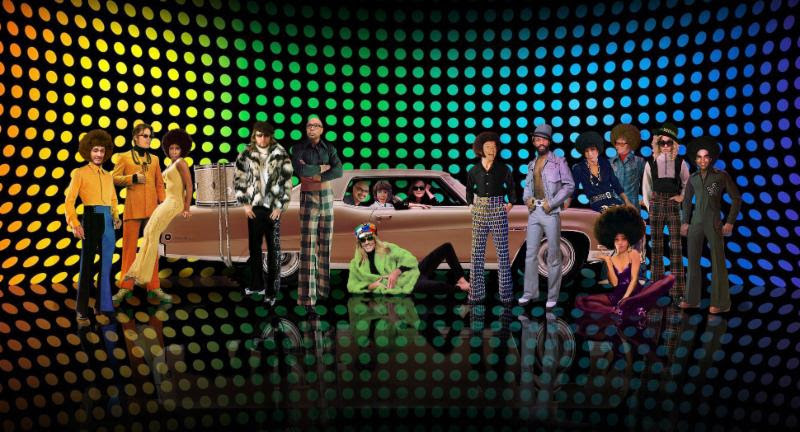 News reports could only speculate as to the whereabouts of the legendary funksters as fans across the globe held their breath for news of the fate of the band. Now, in 2017, with their Halloween performance at the Danforth Music Hall just weeks away, several members of the band have been spotted ALIVE and are scouring the globe to find their band mates to once again bring the FUNK to a soulless nation! For updates on this breaking news, visit Chunk o Funk on Facebook or chunkofunk.net. Tickets for Chunk o’ Funk‘s Halloween Blowout at the Danforth Music Hall on Saturday, October 28 are still available at TicketMaster.ca. Previous Previous post: Tune the Thought Channel!